If you are a business owner, then you need to write down the name and number of Beacon Plumbing. We have been in business since 1999, but our technicians have decades of experience under their belts. We truly are built entirely by a team of enthusiastic and knowledgeable technicians, and we are able to stay on top of the plumbing industry because of wonderful customers like you. Plumbing problems can pop up at any time, and those times are never convenient! In fact, having a plumbing problem at your business could force you to shut down until it is solved. This can cause financial hardship on a business owner. In order to prevent such hardship, we offer a wide variety of plumbing services to help you get back on your feet in no time. We can also assist you with all your kitchen plumbing needs. Our kitchen plumbing services are fantastic if you own a restaurant, café, or coffee house in the Tacoma area. Before you run into any plumbing or heating problems at your Tacoma business, write down our information. You will be happy you did! Our services are so in demand that we have branched out to provide services to Seattle, Kent, Renton, Olympia, Lacey, Tumwater, and more. You can view more information regarding our service locations, hours, staff, and services at www.beaconplumbing.net. You can also call us at 253.655.4599. The Beacon Plumbing website was designed and built by this Tacoma web design company. At Beacon Plumbing and Heating, we take care of our customers in regards to their boiler repair in Kent. We offer great customer service in addition to high quality work. Our boiler repair technicians are all licensed, bonded, and insured, and go through a thorough screening process before being sent to your home. We maintain the highest standards so that you can rest easy, knowing all your boiler needs are being taken care of by professionals in the industry. A malfunctioning boiler costs more to operate, and therefor raises your monthly bills. Many customers ignore the early signs of a malfunctioning boiler and then end up paying a premium each month. Avoid this pitfall by paying attention to your boiler and getting it fixed the moment it starts to malfunction. In order to stay on top of your boilers health, and improve its lifespan, you should practice regular boiler maintenance. In addition to boiler repair in Kent, we offer a number of other heating services in Kent. From furnace repair to installation, we have you covered. We routinely work with heat pumps, furnaces of all kinds, hydronic heating systems, and more. Our services are affordable and high quality, which are two reasons why people love us. We also offer emergency heating service to our customers, giving them ease of mind and confidence during an emergency. If you thought we were merely a heating company, then you would be wrong. We offer fantastic plumbing in Kent! Our plumbing services are unmatched by our competitors. We offer drain clearing, burst pipe repair, bathroom and kitchen installation, and more! We also offer our emergency services to plumbing customers as well as our heating customers. This allows you to get the help you need when you need it! With Beacon Plumbing and Heating, you will never be without help again. There is nothing worse than dealing with a plumbing disaster, and unfortunately winter is a prime season for it. We service many areas in the Puget Sound and also extend our services to business owners. Having clogged drains can put a huge damper on your day. If you notice any of these signs, it is best to call a plumber right away. Water damage and bacteria can pose a serious threat to your health and the health of your home. For less serious clogs, such as hair, there are simpler methods that may be used. If you are a business owner in the Seattle area, then it is imperative to have the contact information of a good plumber. We always put our customers first and know that unless you get help, you may have to close shop until your plumbing issues are fixed. We never want to see a business owner suffer due to a plumbing emergency, so we offer emergency services that are affordable and easily accessible. We also offer heating services in Seattle. Some of our popular heating services include furnace repair and furnace installation. Our technicians specialize in repairing and installing many different types of heating units. We regularly work with boilers, heat pumps, water heaters, and hydronic heating systems. The next time you need drain clearing and cleaning, commercial plumbing, or heating services in Seattle, give us a call. You can also view our website to find out more information regarding our services, service locations, staff, and hours. Emergency plumbing is a service that not all plumbing companies offer. We offer this service at Beacon Plumbing and Heating because we care about our customers and would never want to leave you high and dry! Emergencies can pop up at the most inconvenient times, and if you don’t have a plan then you will be left scrambling for anyone who can help. This is how many people get suckered into services that are too expensive and lacking in quality. Emergency plumbing in Lynnwood is only one of the services we enjoy offering our customers. Our services are not only affordable, but they are also high quality. All of our equipment is high quality and our technicians are educated and passionate about their job. If you are looking for a technician that is both professional and friendly, you will find one through us. Our team is licensed, bonded, and insured, giving you the highest level of confidence in our professionalism. We also pre-screen our employees to make sure they are fit to go to your home. We place your safety and satisfaction above all else, and will do everything we can to maintain your confidence. Our plumbers are highly experienced. They can solve any problem you present them with. Many calls are due to pesky drains. Drains get clogged in many households and can easily be cleared by a professional. Drains often get clogged due to debris and other objects and can have an effect on your quality of life if left unsolved. In fact, clogged drains can cause water damage and many other problems that are expensive and unnecessary. Prevent such problems by giving us a call and getting an experienced and qualified plumber to your house. If you have used our plumbing services in the past and were satisfied, then keep us in mind for all your household and business heating needs. We offer furnace repair and installation as well as many other services. Our technicians can help you choose the right unit for your household based on your personal tastes and your household requirements. The next time you need help with your plumbing or heating, give us a call. We can’t wait to hear from you! For more information, visit our website at www.beaconplumbing.net. You can find information on our service areas, services, staff, and hours. The Beacon Plumbing and Plumbing website was built by this Seattle web design company. Beacon Plumbing and Heating provides emergency plumbing in Puyallup. Emergency plumbing in Puyallup is a must-have service if you are a homeowner or business owner in the Puyallup area. Without a plan, you will be at a loss for how to respond when an emergency occurs. That is why it’s a good idea to find a company that you like and keep their information handy so that you are prepared. Lives are hectic in today’s world. A toilet, sink, or bathtub clog could put a huge kink in your plans and prevent you from looking and feeling your best. For business owners, any one of the above problems can force them to close shop for a period of time, which can affect their income and service. Our emergency plumbing crew will gladly fix your problem for you, so that you can get back to your life quickly. We are experts at drain clearing and can have your pipes up and running in no time! Our plumbing team at Beacon Plumbing and Heating is the best in the state of Washington. They are all licensed, bonded, and insured, and hold the highest standards of professionalism. Before employment, each plumber is thoroughly pre-screened to ensure that they are reliable, safe, and knowledgeable. Our plumbers can fix many different problems, as well as install many different types of plumbing equipment. They routinely complete kitchen and bathroom installation projects for customers all over the Puget Sound. If you thought Beacon Plumbing and Heating only offered plumbing services then you would be wrong. Our team happily offers a wide variety of heating services as well! In fact, we have employees who are trained heating technicians. They can help you solve your repair and install needs. If you are looking to get a furnace repair or installation service, then give us a call! During the winter season we get a lot of calls regarding furnace repair. We can fix many different types of units to make sure that you and your house is safe. A malfunctioning furnace can be dangerous for you and your family, so be sure to get any issues fixed as quickly as you can. We also offer emergency repair services for heating in addition to plumbing. Beacon Plumbing and Heating is the best residential plumber in Tumwater. We offer transparency in our billing practices. We are affordable, yet provide high quality work. Our technicians are all pre-screened before employment. Our reputation is built on our friendliness and great customer service. We offer emergency plumbing and heating services. Our customers love the fact that we offer a wide variety of affordable services, including our ever popular emergency plumbing srevice. Residential plumbing is a skill that most homeowners do not have. Instead of attempting to solve your residential plumbing problems yourself, consider hiring a professional. It is a safer and more efficient way to get your plumbing back on track. Not only will our services improve your quality of life, but they will also free you up to take on other important tasks in your life. Our emergency plumbers in Tumwater can help you solve your plumbing problems fast! From running toilets to leaking faucets, we are here for you! Because our services are for emergency situations, you can call us anytime and we will dispatch one of our technicians immediately. Having quick help will aid in preventing water damage that may destroy parts of your home. In addition to plumbing and emergency services, we also provide heating services in Tumwater. Our heating services include furnace repair, furnace installation, and more! We specialize in repair and installation of water heaters, heating units, and heat pumps. We can even help you with your hydronic heating needs! Our customers know that they can get the best heating services in the area from our company. We offer affordability and service that is unmatched anywhere else. We care about our customers too, which means we always go the extra mile to ensure your safety and satisfaction. We will be honest with you at all times regarding the state of your plumbing and heating. If it is repairable, then we will repair it. If you need a new installation, then we will walk you through that process as well. At the end of the day, we are here to help you and make your life easier. We have a skill that will improve your homes function so that you can be free to take care of your family and yourself. The next time you need a residential plumber in Tumwater, call us. Beacon Plumbing and Heating is the number one resource for new water heaters in Tumwater. A water heater is what regulates the temperature of the water you use on a daily basis. From brushing your teeth to taking a bubble bath, your water heater plays an important role. Without it functioning properly, you may experience loss of heat, spurts of water, and odd smelling water. Your quality of life and safety rely on having a high functioning water heater. If you have been noticing that your water turns very hot or very cold then it could be time to call us at Beacon Plumbing and Heating. While there are generally other signs of a water heater problem, water temperature is the top complaint that we get. If your water heater is beyond repairable, then we will suggest you purchase a new water heater and allow us to install it for you. We will never pressure you to do anything. However, our technicians are highly trained, educated, and passionate about your safety, so allowing them to advise you is a wise decision for you and your home. If a technician comes to your home and notices that your water heater is easily repairable, then he or she will speak with you about it and give you an estimate on the cost. Our technicians always work around your schedule so that you can maintain your daily routine and still get great plumbing service when you need it. All of our employees are licensed, bonded, and insured, to give you the highest level of confidence in their ability to get the job done right. At Beacon Plumbing and Heating, we offer a wide variety of services. Water heaters are only a small piece of what we do. We can help you with plumbing, air conditioning units, heating units, drain cleaning, drain repair, furnace repair, hydronic heating, sewers, and more! We even offer emergency plumbing and heating service so that you can get help at a moments notice! This is a great service for business owners or homeowners that are stuck in a plumbing or heating emergency and don’t know what to do. If left untreated, a plumbing or heating emergency can do a lot of damage. Let us help you! Give us a call today at 360.515.7075. The Beacon Plumbing and Heating website was built by this Tacoma web design company. Are you dealing with, or trying to prevent burst pipes in Tumwater? If you are, then give Beacon Plumbing and Heating a call. Burst pipes occur when the water that is trapped in your pipes freezes over. Once this happens, the pipe cannot expand and instead bursts to compensate. An untreated burst pipe can lead to costly water damage and other problems that take longer to fix and are generally more expensive. That is why it’s important to get a trusted plumber to your house quickly to access the damage and restore your piping. In addition to helping solve your burst pipe problem, we also offer emergency plumbing services in Tumwater. Emergency plumbing is a great service to count on because it means that anytime you are in over your head, we can send someone out immediately. Whether you are dealing with water damage or an overflowing toilet, we can help. Our emergency plumbing technicians have seen it all, and generally know how to solve each problem right away. They work odd hours so that you know you have someone available when you need them the most. We also offer emergency heating services to those that are in need of furnace repair. At Beacon Plumbing and Heating, we take care of all your heating needs as well. We repair and install furnaces, repair and install water heaters, and much more! Because we are in the midst of the winter season, many people are wanting to make sure their furnaces are running efficiently. Our customers know that an inefficient furnace can be dangerous and more expensive. That is why they trust us to come into their homes and fix or install their furnace for them. If you are a new homeowner or you are buying your first furnace, our educated heating technicians can help you decide what the best option is for you based on your personality, your home, and your budget. A new furnace install is the best opportunity to ensure that you have a unit installed that suits all of your needs. Give us a call today or check us out at www.beaconplumbing.net. Our team can’t wait to speak with you regarding your plumbing and heating needs! 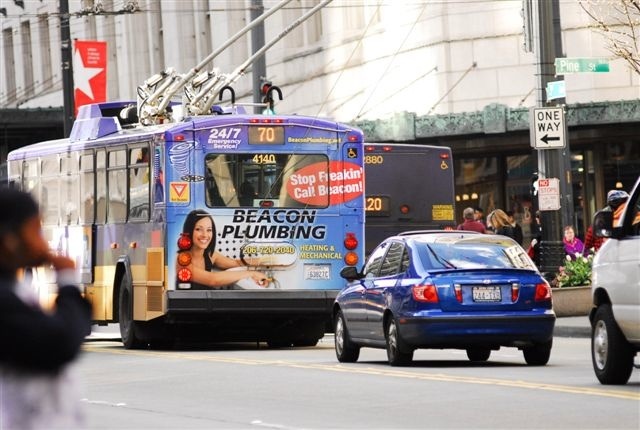 Beacon Plumbing and Heating is a Tumwater commercial plumber that offers commercial plumbing services to Tumwater and other Puget Sound areas. Commercial plumbing involves any and all plumbing services offered to business owners. Due to strict codes and regulations, having plumbing that is working properly and efficiently is mandatory. It also makes for better customer service, as customers love a well working restroom while they are out dining or shopping on the town! The next time you need someone to take care of your business’s plumbing, give us a call. We have a large team of qualified and professional plumbing technicians that can fix a multitude of problems at an affordable rate. Rather then spending your time shopping around for different plumbers, give us a call and allow us to exceed your expectations the first time around. We are licensed, bonded, and insured, giving you every confidence in our ability to be timely, respectful, and honest. Our work is exceptional and our people are friendly! In addition to regular commercial plumbing, we also offer emergency plumbing services. Our customers truly appreciate this service because it gives them comfort knowing they can get help anytime they need it. Plumbing emergencies are just a part of life, and a part of owning a business. Keeping a calm head while trying to deal with your plumbing emergency is the first step. After you have noticed your emergency, give us a call. We will dispatch one of our trained technicians to diagnose the problem and fix it right away. This service ensures that your business stays open and up to code at all times. At Beacon we take care of just about everything. We even offer many heating services. From furnace repair to water heater installation, we have it covered. Winter is generally a busy time of year because many people are noticing that they have furnace problems. If you are one of those people, give us a call. Having an inefficient furnace can be costly and dangerous. To find out more about our services, hours, staff, and locations, visit our website at www.beaconplumbing.net. You can also give us a call at 206.452.3130. We cannot wait to speak with you about your commercial plumbing needs. Your Seattle business deserves the best! 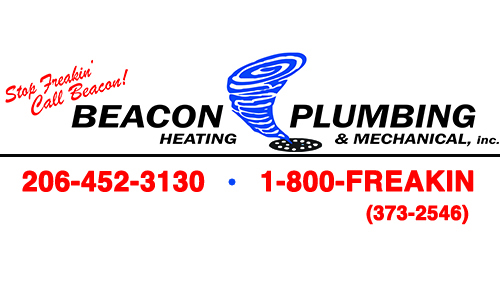 Beacon Plumbing and Heating is the premier provider of furnace repair in Tumwater. There are plenty of reasons for needing furnace repair. Even if your furnace is not broken, it should still get repaired on occasion to keep it in top condition. This is where our fantastic furnace repair technicians come in handy. Our technicians are highly skilled, educated, and pre-screened thoroughly before being sent to your home or business. If you are dealing with a broken furnace, our technicians are the people to call. Not only does it cost you more money to run an inefficient furnace, it is dangerous too. Many people are poisoned with carbon monoxide each year due to malfunctioning furnaces. Don’t let you or your family fall victim to the dangers of a malfunctioning or broken furnace. You may already know that your current furnace is not repairable. In this situation, you will most likely be looking at getting a new furnace installation. A new furnace installation may cost a bit more up-front, but it is safer and more price effective in the long run. It also gives you a unique and rewarding opportunity to replace your homes old furnace with something new that suits your personal taste and functional needs. This is an attractive opportunity for those that are looking for a more energy efficient or “green” heating option. Our qualified team members are available to speak with you about options that work well for you, your home, and your price range. Our customers love the fact that we offer emergency repair services for heating and plumbing. Any time you are caught in an emergency situation, give us a call and we will send someone to your home or business as soon as possible. To speak with our team about furnace repair, installation, and plumbing, give us a call at 360.515.7075. You can also view our website at www.beaconplumbing.net to find out more information regarding our technicians, our hours, our location, and our services.